So me & Luis have gone to his company X-mas party for the past 2 years. It's open bar and they have raffles and dancing. I like going, we have a good time. So this year when they asked Luis if we were coming he had to say no because Lili won't take a bottle, so we can't leave her at a babysitter. It sucked, but that's what happens when you have kids. So why is she drinking a bottle in this picture? Lili decided that she would take a bottle, on the night of the party. It was like she was saying, "Haha, you could have gone!" 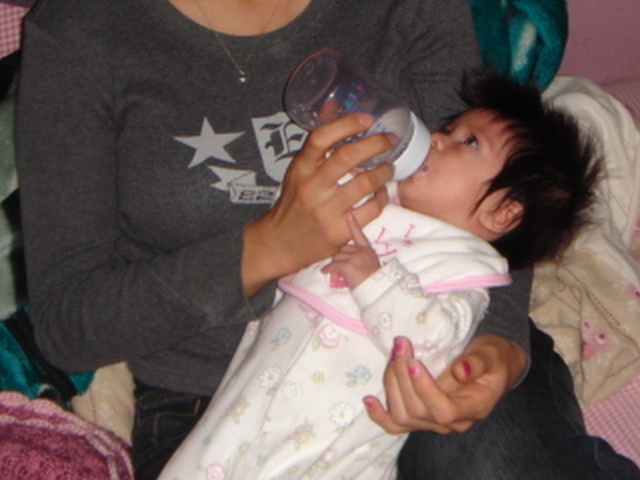 She will take a bottle every big once and a while when she feels like it. Picky-picky! There's always next year!